Is my marketing working? It sounds like a simple question, but in today's complex environment, answering it correctly is a challenge. To help advance advertising measurement, we’ve invested in third-party accreditations through the Media Rating Council (MRC), and partnerships with leading measurement technology providers. Together, these efforts help ensure that the metrics our advertising solutions deliver are trusted, align with industry standards, and can be compared across providers. We’ve also made progress with Google Measurement Partners for viewability, brand safety, and reach reporting on YouTube. Advertisers consistently tell us that they struggle with comparing media placements to determine where to invest their limited marketing resources. It’s a problem that’s made even worse when media providers use different definitions of commonly accepted metrics like clicks, impressions, and viewable impressions. By endorsing the MRC standards and Interactive Advertising Bureau (IAB) guidelines for media measurement, we stand on the side of marketers, who deserve transparency and fairness in their media buys. Below, you’ll see the comprehensive list of MRC accreditations we currently maintain across search, display, and video ads on the web and in apps. Accredited metrics include various aspects of our clicks, served impressions, viewable impressions, and invalid traffic detection and filtration. With today’s announcements, YouTube video ad impressions and viewability metrics for desktop, mobile web, and mobile in-app are now fully MRC accredited in Google Ads, Display & Video 360, and Campaign Manager. 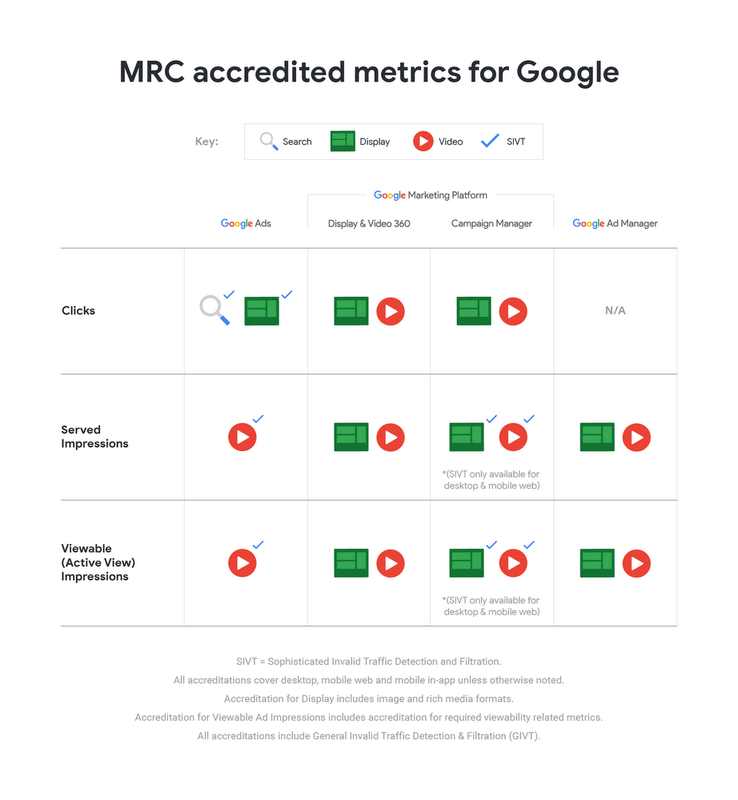 And we’ve begun the audit process for MRC accreditation of recently added metrics, including brand safety and Unique Reach reporting on YouTube in Google Ads. 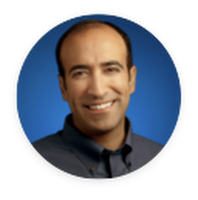 “Google’s efforts to create transparency and choice through MRC accreditation demonstrates their commitment to delivering a better, more responsible advertising ecosystem. 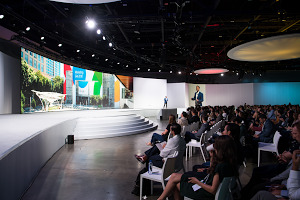 The ultimate goal is to ensure transparency at every step in the complex advertising supply chain, and Google’s efforts are helping us achieve that objective." To help advertisers measure YouTube media in a verified, privacy-safe way with the measurement solution of their choice, we've also made progress with Google Measurement Partners for viewability, brand safety, and reach reporting. First, the YouTube data feed for video viewability reporting by third-parties is currently under audit by the MRC. Our ultimate goal is to achieve MRC accreditation for our integrations with DoubleVerify and Integral Ad Science (IAS), so advertisers can be confident that YouTube metrics have been third-party verified, no matter where they choose to measure. We’re also expanding our partnerships for reach measurement, which now include Nielsen, comScore, Kantar, and soon, Meetrics. This month, YouTube’s integration with Nielsen for mobile in-app measurement has expanded to Australia and Italy. This is in addition to the U.S., Canada, Japan, U.K., Germany, and France which are already available. To know if their marketing is working, advertisers need access to accurate, timely metrics they can trust, regardless of which measurement provider they choose. Looking to the future, we’ll continue investing in measurement solutions and partnerships that help advertisers understand and compare the impact of their investments using commonly accepted metrics and standards.